The Summer Concert Series returns from last year bigger and better than ever. The Beatles Tribute act, “Something New” will bring you back in time to recapture the sounds of the Beatles as they perform songs from 1964 – 1970. Created in 1996 by Joe Colangelo (Paul) with the home base at Rosehill Music Center in Thornwood, the band has performed more shows than we can count in Westchester, Putnam and Connecticut. 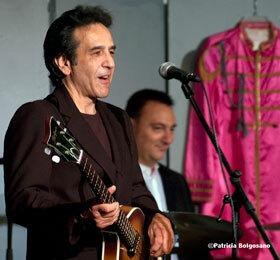 The other band mates are Rich Berta (John), Mike Montinola (George), and Mike Naimoli (Ringo). They play multiple instruments to get the true live sounds from the early years and beyond. Be ready for some trivia fun to test your Beatles knowledge. Moved inside because of rain, the overflowing crowd rewarded the performers with a standing tribute at the end. Gallery photos from the July 23 concert courtesy of Patricia Bolgosano.